Osseous surgery is an effective treatment for periodontal disease that has advanced to the point of threatening not only gum tissue, but the bone as well. 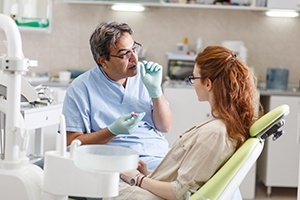 Also called pocket reduction surgery or gingivectomy, osseous surgery in Worcester may be recommended in cases where non-surgical treatment such scaling and root planing would not be sufficient to stop the advance of bacteria that have invaded the area. Left untreated, periodontitis can lead to tooth loss. When is Osseous Surgery Necessary? Osseous surgery is needed only when non-surgical treatment is not an option. Most people are able to keep their teeth and gums healthy with daily oral hygiene that is founded on brushing with fluoride toothpaste and flossing. This practice helps remove plaque, the bacterial film that causes gum disease. Professional dental cleanings are also advisable in order to remove bacterial deposits below the gum line. Normally, gum and bone tissue fit snuggly around your teeth. However, as periodontal disease advances, gum tissue begins to pull away from teeth, exposing more of the root and creating what are called gum pockets. As these pockets deepen over time, there is room for more bacteria. Eventually, bacteria invade below the gum line, causing further gum and bone tissue loss. In this case, osseous surgery is needed to remove bacteria and prevent further damage or even tooth loss. Osseous surgery is performed by a periodontist in Worcester. It is a minor surgery done under local anesthetic. Once the area is numb, just enough gum tissue is folded back away from the tooth so that the diseased root surfaces are visible. Then, bacterial deposits that have hardened onto the tooth can be removed. Next, the tooth is smoothed and reshaped, and the bone is re-contoured in order to eliminate gum pockets. Finally, gum tissue is put back into place and closed with stitches. A dressing is usually placed over the site to keep the area undisturbed, at least for the first several days after surgery. The doctor and his staff will send you home with detailed instructions on how to care for the surgical site, how to alleviate discomfort and swelling and how to maintain a nutritious diet that will promote healing and reattachment of gum tissue to your teeth. Does Osseous Surgery Cure Periodontal Disease? Unfortunately, the answer to that question is no. The bacteria that started the problem will still be present in your mouth. Therefore, a stringent oral hygiene routine at home is essential. In particular, bacteria must be kept off teeth that have been treated with surgery so that reattachment and healing can happen. That’s why excellent home care and several post-operative visits are required.